It's small enough to fit inside a shoebox, yet this robot on four wheels has a big mission: keeping factories and other large facilities safe from hackers. "Robots do more now than they ever have, and some companies are moving forward with, not just the assembly line robots, but free-standing robots that can actually drive around factory floors," said Raheem Beyah, the Motorola Foundation Professor and interim Steve W. Chaddick School Chair in Georgia Tech's School of Electrical and Computer Engineering. "In that type of setting, you can imagine how dangerous this could be if a hacker gains access to those machines. At a minimum, they could cause harm to whatever products are being produced. If it's a large enough robot, it could destroy parts or the assembly line. In a worst-case scenario, it could injure or cause death to the humans in the vicinity." Internet security professionals long have employed decoy computer systems known as "honeypots" as a way to throw cyberattackers off the trail. The research team applied the same concept to the HoneyBot, which is partially funded with a grant from the National Science Foundation. Once hackers gain access to the decoy, they leave behind valuable information that can help companies further secure their networks. "A lot of cyberattacks go unanswered or unpunished because there's this level of anonymity afforded to malicious actors on the internet, and it's hard for companies to say who is responsible," said Celine Irvene, a Georgia Tech graduate student who worked with Beyah to devise the new robot. "Honeypots give security professionals the ability to study the attackers, determine what methods they are using, and figure out where they are or potentially even who they are." The gadget can be monitored and controlled through the internet. But unlike other remote-controlled robots, the HoneyBot's special ability is tricking its operators into thinking it is performing one task, when in reality it's doing something completely different. "The idea behind a honeypot is that you don't want the attackers to know they're in a honeypot," Beyah said. "If the attacker is smart and is looking out for the potential of a honeypot, maybe they'd look at different sensors on the robot, like an accelerometer or speedometer, to verify the robot is doing what it had been instructed. That's where we would be spoofing that information as well. The hacker would see from looking at the sensors that acceleration occurred from point A to point B." 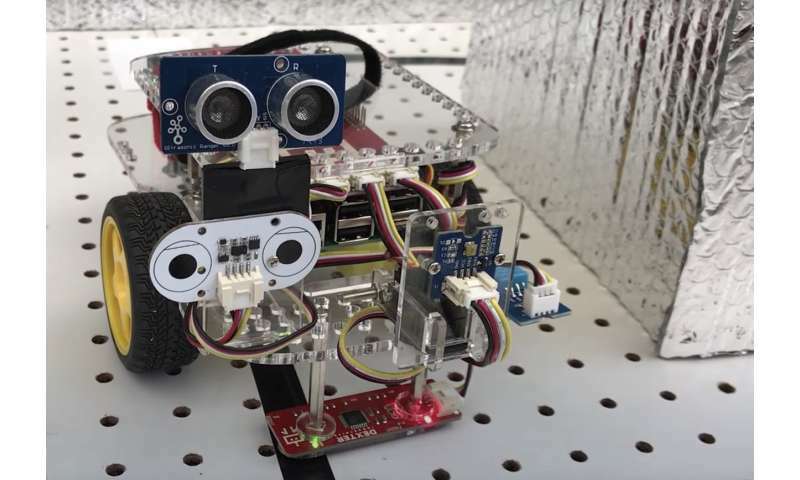 In experiments designed to test how convincing the false sensor data would be to individuals remotely controlling the device, volunteers in December 2017 used a virtual interface to control the robot and could not to see what was happening in real life. To entice the volunteers to break the rules, at specific spots within the maze, they encountered forbidden "shortcuts" that would allow them to finish the maze faster. "We wanted to make sure they felt that this robot was doing this real thing," Beyah said. "This is a good sign because it indicates that we're on the right track," Irvene said. I know lets put a device without wheels or eyes in a box between the home device and the internet and pretend we are a lamp switch or a thermostat and then trap them that way. And you save money on wheels and eyes and all that other stuff. All the hacker is looking for is a digital signature so give them one. Something you think they are looking for then fry their hard drive when they latch on. The title of the article didn't help much either. I was really hoping for lasers or something with hypodermics for teeth like the Hound from Fahrenheit 451. "Robot designed to [help confirm practical theories about how to] defend factories against cyberthreats"